Scott Quigg has had surgery on a broken jaw following his super-bantamweight title defeat by Carl Frampton on Saturday. Bury's Quigg, 27, lost his WBA belt to IBF champion Frampton via a split decision in Manchester. He suffered the injury in round four of what was his first defeat. On Sunday, Quigg's promoter Eddie Hearn tweeted: "Thoughts with @scottquigg currently undergoing surgery on broken jaw... you will be back stronger!" 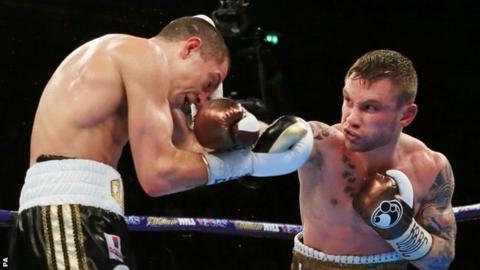 Belfast's Frampton, 29, controlled the first half of Saturday's fight and emerged a deserved winner. He then said he would rather "move on to bigger and better things" than have a rematch. Quigg came on strong in the final rounds but two of the three judges awarded the fight to Frampton in front of 20,000 fans at the Manchester Arena. It was Quigg's first defeat in 34 professional fights, stretching back to 2007. Frampton is undefeated in 22 fights since turning pro in 2009.